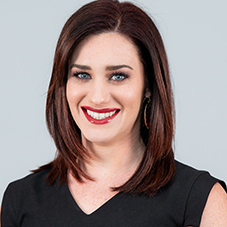 Kelci Gatling (née Lewis) enters her fourth season as Director of Operations for Arkansas gymnastics. Her responsibilities include assisting during practice, setting up for home meets and coordinating travel plans, as well as organizing youth camps and Razorback Clinics. Gatling began in her role as a graduate assistant and earned her master’s degree in 2017. Shortly after graduation, Arkansas made her position a full-time spot on the staff. Gatling was a four-year member and letterwinner for Arkansas gymnastics from 2010-13, where she competed primarily in vault and floor exercise. As a sophomore in 2011, she earned Second Team All-American honors when she scored a 9.85 on floor exercise at the NCAA Championship Session II semifinal. As a junior, Gatling set numerous career-high marks while helping the Razorbacks reach the NCAA Super Six for only the second time in program history. As a senior, Gatling was named to the All-SEC Team and earned team honors of Most Improved Gymnast for her performance in the 2013 season. She was named SEC Specialist of the Week after notching career-high marks of 9.925 in both vault and floor exercise to lead the Razorbacks to a tie against No. 4 Alabama at Barnhill Arena. Gatling was also a dedicated and well-decorated student at Arkansas, as a four-time NACGC/W Academic All-Scholar and two-time team Scholar-Athlete of the Year. She was a member of the Arkansas Student-Athlete Advisory Committee and was named to the SEC Community Service Team in her junior and senior years. In addition, Gatling made SEC Academic Honor Roll twice and was First-Year SEC Honor Roll as a freshman. She graduated in 2013 with a bachelor’s degree in Kinesiology, and returned to Fayetteville to pursue a master’s degree in Physical Education. Gatling is a Collinsville, Oklahoma, native and graduated from Collinsville High School in 2009 as class valedictorian and a 4.0 GPA. Growing up, she competed at Phillips 66 Gymnastics Club and was a three-year level 10 gymnast and three-time state champion. Kelci and husband Chris Gatling were married Aug. 15, 2015.